Introduction: Patient is a 49 y/o male with a PMH significant for osteoarthritis of the hands, knees, and hips, and alpha-gal allergy, who presented for osteoarthritis follow-up and pain medication refill. His osteoarthritis is constant, achy, non-radiating 6/10 pain in the hands and knees, and 5/10 pain in the hips. The pain is worse as the day progresses. Alleviation of the pain occurs in the morning, with rest, and with pain medications. The patient denies any weakness or paresthesias. He has attempted physical therapy in the past with no improvement of pain. Orthopedic surgery has not recommended intervention. On physical exam patient appeared well developed, well nourished, and in no acute distress. Vital signs were within normal limits along with the musculoskeletal, neurological, and gait examination. The patient has noted that he has an alpha-gal allergy. An epinephrine pen is carried with him at all times. Due to this allergy, medications to control osteoarthritic pain must be carefully assessed to limit any anaphylactic reactions that may take place due to the allergy. The patient has been doing well with 5mg solution of oxycodone. Discussion/Summary: Alpha-gal allergy is an IgE-mediated reaction against galactose-alpha-1,3-galactose (alpha-gal). Alpha-gal, a prominent carbohydrate epitope expressed on the tissues of nonprimate mammals, can cause immunological reactions with downstream systemic effects that include angioedema, urticaria, and anaphylaxis1. One study reported patients experiencing these symptoms after haven eaten beef, pork, or lamb; foods rich in alpha-gal1. However, unlike other anaphylactic reactions that are type 1 hypersensitivity reactions, this reaction to alpha-gal occurred 3-6 hours after consumption of the food1. The etiology of IgE antibody production against alpha-gal has been proposed to be due to a tick bite2. Interestingly enough, more than 80% of patients also reported tick bites prior to symptom presentation1. Prescribing medications to patients with alpha-gal allergy has led to difficulties. A majority of medications are prepared with inactive constituents (i.e. magnesium stearate) that are derived from animal sources. Thus, if a patient has an alpha-gal allergy, anaphylactic reactions are possible when taking any medication with this inactive ingredient. 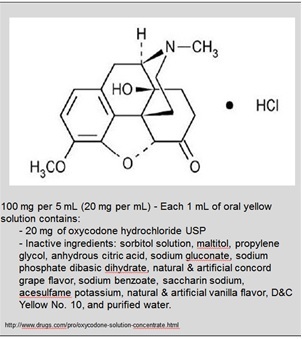 In our patient, prescribing oxycodone in a solution preparation limited the chances of an alpha-gal reaction, and provided the necessary pain control for this patient. Due to alpha-gal allergy, this patient could not be prescribed oral preparations of several pain medications due to preparation with the inactive constituent, magnesium stearate. Instead, oxycodone solution provided to be beneficial, in both pain control as well as limiting any chances of possible anaphylaxis from his alpha-gal allergy. Commins SP, Satinover SM, Hosen J, et al. Delayed anaphylaxis, angioedema, or urticaria after consumption of red meat in patients with IgE antibodies specific for galactose-α-1,3-galactose. The Journal of Allergy and Clinical Immunology.2009;123(2):426-433. Van Nunen SA, O’Connor KS, Clarke LR, et al. An association between tick bite reactions and red meat allergy in humans. The Medical Journal of Australia. 2009;190(9):510-511.